Interesting larger Islamic bowl, likely from Smarkand, dating to the 11th.-12th. century AD. The bowl with cream glaze and decoration in red and black. Size: 205 mm. wide and 85 mm. high. Condition: Choice, intact with fine antique glossy surfaces. 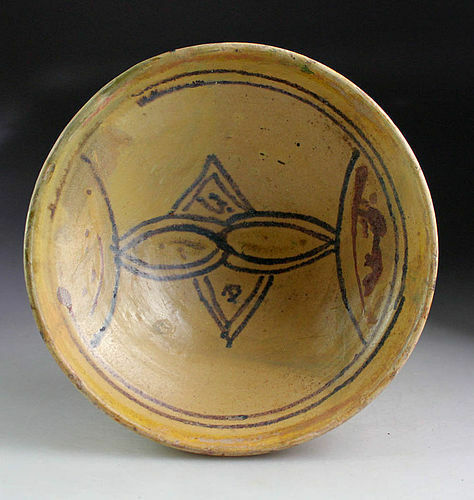 Fine islamic pottery bowl, Western Asia, ca. 11th. century AD Fine islamic pottery bowl, Western Asia, ca. 11th. century AD Islamic pottery bowl, finely decorated ca. 10th.-11th. cent.